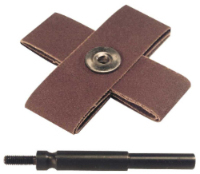 All sizes 8-Ply except 1-1/2" x 1-1/2" x 1/2" and 2" x 2" x 1/2"
Criss-cross configuration allows see-through during operations for closer tolerances on small radii. Ideal for deburring the ends and insides of tubing and deburring stampings or dies. The quick change feature permits operator to replace used pads in seconds.